Want to grow healthy, luscious fresh tomatoes? This free, 20-page tomato growing guide shows you how. 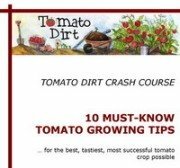 “Tomato Dirt Crash Course: 10 Must-Know Tomato Growing Tips” is filled with must-know information you need to have a successful tomato crop, whether you’re a beginning or experienced gardener. It’s yours free as a gift from Tomato Dirt. Tomatoes are truly easy to grow. At Tomato Dirt, we love growing tomatoes and sharing tomato growing tips with gardeners like you. That’s why we’ve assembled this easy-to-use guide. 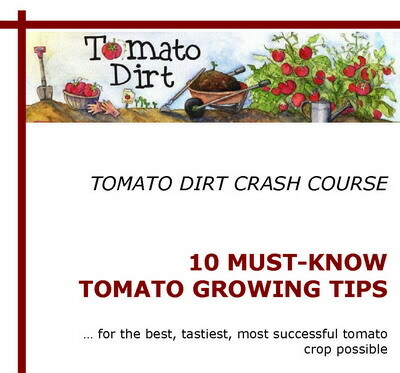 Consider it a crash course in growing tomatoes! Sign up below and to get a link to download your free guide. Then get started with growing delicious, fresh tomatoes … all season long.